The last in the True Series brings you a study of crystals: their uses and powers. Each track very sensitively and harmonically interprets each crystal musically. The booklet contains information on the uses of crystals. 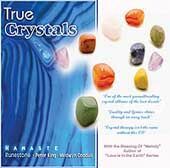 Endorsed by Melody, one of the most significant people today working with crystals.